The understanding of the action in a unitary way, favors the position of the sports complex in the plot. Sports courts, a gym, an indoor pool and a sports hall. All together form a unity. For this reason, the two existing plots become one. The means available in the urban planning have to be used to improve the conditions of the buildings. The unitary conception of this complex improves the possibilities of implantation in the place. In this way an easily recognizable element is achieved as a sports complex, surrounded by vegetation, in a unique environment for sports practice. The possibilities offered by an existing building are endless. Its character can be modified and strengthened by placing new elements that are part of the sports complex. The adaptation to the new proposed uses improves the functioning of the entire complex. Placing the main entrance and the cafeteria in the existing gym, allows the operation of the indoor pool and the future sports pavilion to be incorporated into the new Vimianzo sports complex. Accept the existing elements, incorporate them into the unitary action and enhance their uses to improve the overall performance of the action. A clearly planned, absolutely experienced program, added to a tight budget, favors the decision to opt for construction as the basis of the project. 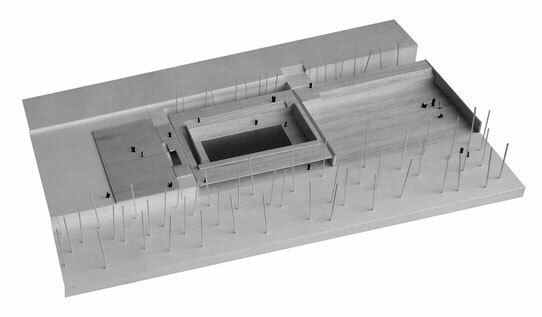 Understand the indoor pool and the sports pavilion as wooden vessels surrounded by concrete walls. The external formwork is reused as an interior finish. Protected with a framework of glued laminated wood that allows the passage of natural light and ventilation of the main space. Under the bleachers, the gym, fitness room and changing rooms. Open to vegetation, favoring natural lighting and ventilation. 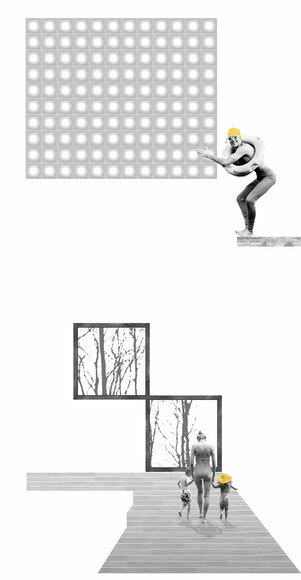 From the materials, concrete and wood, and with the geometry, resounding volume, an essential element is achieved, without unnecessary additions, which is inserted into the landscape protected by the vegetation that surrounds it. The swimming pool and the sports hall covered by natural light. The overhead lighting becomes the element that shapes the interior space. 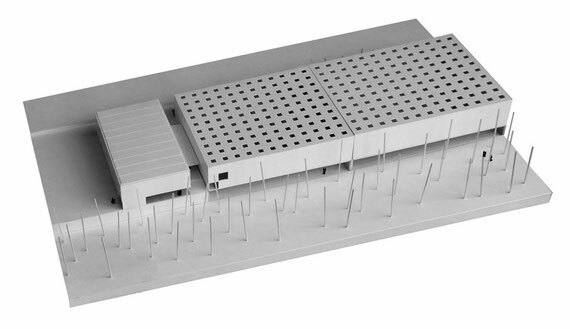 Following the proposed structural grid, some prefabricated modules are proposed as skylights. Ventilation, both in the room and in the main structure, is done through these recordable elements. The seriation of an element guarantees better finishes as well as a faster execution. Only two side holes allow the user to establish a relationship with the outside. 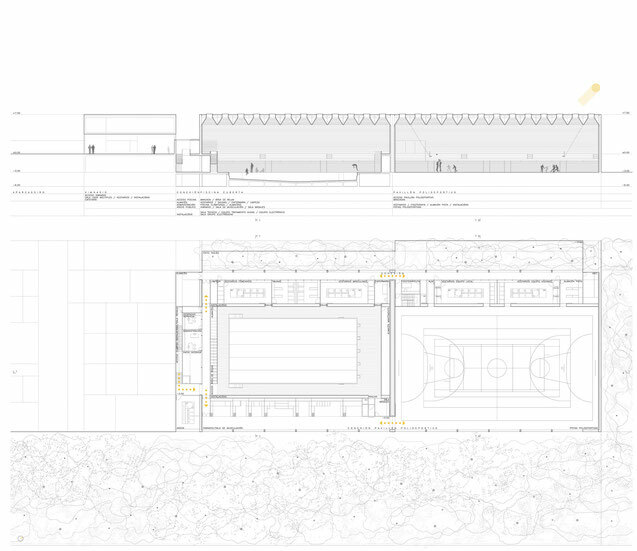 The pool is conceived as a space in which the focus of the swimmer is fundamental and for that reason it is accompanied by homogeneous lighting. Swimmer and pool. Light and water In the sports hall a continuous gap is added at the foot of the track, nature penetrates the pavilion and vice versa. At present, sustainability is understood as an additional element to architecture. Nothing is further from reality. It must be something inherent in her. It must be something natural. In addition, thanks to current technology, the overall performance of buildings must be enhanced and improved. In this case, it starts from a compact volume, protected by vegetation, which opens to receive natural light and also ventilate the interior spaces. The existing photovoltaic solar panels are increased and other thermodynamic elements are added to the pool deck and the sports pavilion. The cover understood as an energetic accumulator, a battery, capable of generating energy 365 days a year, with sun, rain and wind. Some generate electrical energy and the others configure the system of sanitary hot water, heating and heating of the pool water. An installation conceived as a long-term investment that will improve the performance of the entire Vimianzo sports complex.